Hvorfor betale for en dyr cab ride, når der er et simpelt, omkostningseffektivt alternativ til rådighed 24/7? Rejse fra Baltimore-Washington International Airport (BWI) til ethvert hotel i downtown Washington, DC via dette økonomiske, delte køretøj. Nyd den stressfri komfort og bekvemmelighed ved en-vejs, dør-til-dør rejse - 24 timer i døgnet, syv dage hver uge. Der er højst to kufferter og to små vedligeholdelsesdele pr. Person, tak. At komme fra lufthavnen til et lokalt hotel kan være kompliceret, men det behøver ikke at være. Der er en bekvem løsning, der tager alt det besvær og gætteri ud af at leje en bil eller betaler for en dyr taxa efter en lang flyvning. Forenkle hele processen ved ankomsten til Baltimore-Washington International Airport (BWI). Rejser fra lufthavnen til ethvert hotel i downtown Washington, DC i stil og komfort ved at arrangere et delt transportbil. Du skal blot angive ankomstoplysninger og fuld adresse på ankomststedet i Washington DC-området. Overførslen vil blive bekræftet med det samme og et rejsekupon udstedes til stede for chaufføren. Der er højst to kufferter og to små vedligeholdelsesdele pr. Person, tak. Service fra Baltimore-Washington International Airport til downtown Washington, DC er tilgængelig syv dage om ugen. Denne ultra-bekvem form for transport vil altid være klar til at rulle. Bemærk: Der er separate overførsler tilgængelige fra Baltimore-Washington International Airport til Baltimore hoteller (søg venligst under 'Baltimore') og fra Washington Dulles International Airport til downtown Washington, DC. the only thing I would suggest is when going to a far away place like DC they should only have DC travelers on the van or people on the way to DC. It took me 2 1/2 hours for a trip that would of taken take 45 minutes . Transport was fine, though took a little time to track down the representative kerb side at the airport. Other than that - no problems. 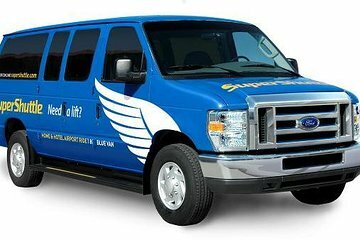 Very easy to find the pick up site from BWI airport. The lady dispatcher is very helpful and nice. There were 5 passengers in my ride, I was the 2nd to be drop off. The driver lady was nice too but she took extra cautiousness while driving every car passed us..., it took a little longer to go to my hotel, nevertheless, it's absolutely a safe ride. I did not use this service! The transfer was perfectly organised, we could wait inside and I got to the hotel quicker than I thought I would. Totally worth the price! It was hard to locate them at the airport as they no longer have the kiosk and only people who are walking around in blue jackets. Even then the person who was supposed to be there was not. Then I find out that my reservation through viator was not confirmed when I arrived which meant I had to wait an hour before I could even get on a van to the city. I was the only rider in the van and hat a good conversation with the driver. The waiting was a little bit long, but the end is good, everything is good! I was dropped off at the wrong hotel, almost 3/4 mile away. Everything ok. The issue here is that, the waiting time for the shuttle was around 30 minutes.